A cosmic-ray observatory is a scientific installation built to detect high-energy-particles coming from space called cosmic rays. This typically includes photons (high-energy light), electrons, protons, and some heavier nuclei, as well as antimatter particles. About 90% of cosmic rays are protons, 9% are alpha particles, and the remaining ~1% are other particles. It is not yet possible to build image forming optics for cosmic rays, like a Wolter telescope for lower energy X-rays, although some cosmic-ray observatories also look for high energy gamma rays and x-rays. Ultra-high-energy cosmic rays (UHEC) pose further detection problems. One way of learning about cosmic rays is using different detectors to observe aspects of a cosmic ray air shower. For example, while a visible light photon may have an energy of a few eV, a cosmic gamma ray may exceed a TeV (1,000,000,000,000 eV). Sometimes cosmic gamma rays (photons) are not grouped with nuclei cosmic rays. "In 1952, a simple and audacious experiment allowed the first observation of Cherenkov light produced by cosmic rays passing through the atmosphere, giving birth to a new field of astronomy". This work, involving minimal instrument expense (laughably a dustbin, a war-surplus parabolic mirror, and a 5 cm diameter photomultiplier tube), and based on a suggestion by Patrick Blackett, led ultimately to our current international multibillion-dollar investment in gamma ray astronomy. Sometimes the instrumentation would report the expected cosmic ray count (approximately thirty counts per second) but sometimes it would show a peculiar zero counts per second. The University of Iowa (under Van Allen) noted that all of the zero counts per second reports were from an altitude of 2,000+ km (1,250+ miles) over South America, while passes at 500 km (310 mi) would show the expected level of cosmic rays. Later, after Explorer 3, it was concluded that the original Geiger counter had been overwhelmed ("saturated") by strong radiation coming from a belt of charged particles trapped in space by the Earth's magnetic field. This belt of charged particles is now known as the Van Allen radiation belt. Cosmic rays were studied aboard the space station Mir in the late 20th century, such as with the SilEye experiment. This studied the relationship between flashes seen by astronauts in space and cosmic rays, the cosmic ray visual phenomena. In December 1993, an observatory named the Akeno Giant Air Shower Array (abbreviated AGASA) recorded one of the highest energy cosmic ray events ever observed. In October 2003, the Pierre Augur Observatory completed construction on its 100th surface detector and became the largest cosmic-ray array in the world. It detects cosmic rays through the use of two different methods: watching high-energy particles interact with water, and observing ultraviolet light emitted in the earth's atmosphere. In 2018, the installation of an upgrade called AugerPrime has started adding scintillation and radio detectors to the Pierre Auger Observatory. In 2010, an expanded version of AMANDA named IceCube was completed. IceCube measures Cherenkov light in a cubic kilometer of transparent ice. It is estimated to detect 275 million cosmic rays every day. Space shuttle Endeavor transported the Alphamagnetic Spectrometer (AMS) to the International Space Station on May 16, 2011. In just over one year of operating, the AMS collected data on 17 billion cosmic-ray events. LOPES – the LOFAR PrototypE Station is the radio extension of KASCADE. MARIACHI – Mixed Apparatus for Radar Investigation of Cosmic-rays of High Ionization located on Long Island, USA. GRAPES-3 (Gamma Ray Astronomy PeV EnergieS 3rd establishment) is a project for cosmic ray study with air shower detector array and large area muon detectors at Ooty in southern India. The COSMICi project at Florida A&M University is developing technology for a distributed network of low-cost detectors for UHECR showers in collaboration with MARIACHI. ^ Wolter, H. (1952). "Glancing Incidence Mirror Systems as Imaging Optics for X-rays". Annalen der Physik. 10 (1–2): 94–114. Bibcode:1952AnP...445...94W. doi:10.1002/andp.19524450108. ^ Wolter, H. (1952). "Verallgemeinerte Schwarzschildsche Spiegelsysteme streifender Reflexion als Optiken für Röntgenstrahlen". Annalen der Physik. 10 (4–5): 286–295. Bibcode:1952AnP...445..286W. doi:10.1002/andp.19524450410. 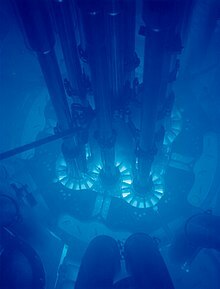 ^ "The discovery of air-Cherenkov radiation". ^ Galbraith, W.; Jelley, J.V. (1952). "Light Pulses from the Night Sky associated with Cosmic Rays". Nature. 171 (4347): 349–350. Bibcode:1953Natur.171..349G. doi:10.1038/171349a0. ^ "Explorer-I and Jupiter-C". Data Sheet. Department of Astronautics, National Air and Space Museum, Smithsonian Institution. Retrieved 2008-02-09. ^ a b Bidoli, V; Casolino, M; De Pascale, MP; Furano, G; Morselli, A; Narici, L; Picozza, P; Reali, E; Sparvoli, R; Galper, AM; Ozerov YuV, Popov AV; Vavilov, NR; Alexandrov, AP; Avdeev, SV; Yu, Baturin; Yu, Budarin; Padalko, G; Shabelnikov, VG; Barbellini, G; Bonvicini, W; Vacchi, A; Zampa, N; Bartalucci, S; Mazzenga, G; Ricci, M; Adriani, O; Spillantini, P; Boezio, M; Carlson, P; Fuglesang, C; Castellini, G; Sannita, WG (2000). "Study of cosmic rays and light flashes on board Space Station MIR: the SilEye experiment". Adv Space Res. 25 (10): 2075–9. Bibcode:2000AdSpR..25.2075B. doi:10.1016/s0273-1177(99)01017-0. PMID 11542859. ^ a b c d e "Cosmic rays | CERN timelines". timeline.web.cern.ch. Retrieved 2017-09-15. The Pierre Auger Collaboration (2007). "Correlation of the Highest-Energy Cosmic Rays with Nearby Extragalactic Objects". Science. 318 (5852): 938–943. arXiv:0711.2256. Bibcode:2007Sci...318..938P. doi:10.1126/science.1151124. PMID 17991855. Clay, Roger; Dawson, Bruce (1997). Cosmic Bullets: High Energy Particles in Astrophysics. Cambridge, MA: Perseus Books. ISBN 978-0-7382-0139-9. → A good introduction to ultra-high energy cosmic rays. Elbert, Jerome W.; Sommers, Paul (1995). "In search of a source for the 320 EeV Fly's Eye cosmic ray". The Astrophysical Journal. 441: 151–161. arXiv:astro-ph/9410069. Bibcode:1995ApJ...441..151E. doi:10.1086/175345. Seife, Charles (2000). "Fly's Eye Spies Highs in Cosmic Rays' Demise". Science. 288 (5469): 1147. doi:10.1126/science.288.5469.1147a. The Highest Energy Particle Ever Recorded The details of the event from the official site of the Fly's Eye detector. Origin of energetic space particles pinpointed, by Mark Peplow for news@nature.com, published January 13, 2005.